The day Raymond E. Beckham (BA ’49) was hired as a fundraiser for BYU in 1949, the administration told him there was no money to pay him and he’d have to bring in enough to cover his own salary. That didn’t faze Beckham, who would not only earn his keep at BYU but, over a 42-year-career as a professor and director of various departments, build the university’s programs, infrastructure, and reputation in countless ways. Beckham, who will be recognized at the 2018 BYU Homecoming as the honored founder, was visionary, and his creativity, intelligence, and commitment to BYU were compounded by an unparalleled work ethic. When Beckham was hired, BYU had just four permanent buildings. Today, every BYU student has visited the Marriott Center, LaVell Edwards Stadium, or the Museum of Art—all buildings for which Beckham raised funds. And most have benefited in other ways from his prodigious efforts. Ray Beckham's influence extended to nearly every corner of campus. Photo courtesy Beckham family. When Beckham saw a need or opportunity, the Arizona native acted. In 1960 BYU decided to part with its mountain property up Provo Canyon, but Beckham convinced the university it could be an ideal setting for a family camp for alumni. He found 111 alums willing to each sign a $1,000 note as loan collateral. Then he got to work laying pipe and building cabins—doing much of the labor himself. The Alumni Association repaid its loan, Aspen Grove took off, and BYU’s alumni have made use of its amenities and programs ever since. Beckham was unafraid to try new things. For example, he opened BYU extensions in Salt Lake City and Las Vegas and sent faculty down to Vegas each weekend in a small chartered plane to teach classes in education, history, math, and humanities. He created on-site management training for Geneva Steel executives and hired faculty to travel the state offering advanced courses to schoolteachers. As a professor of public relations, marketing, and communications, Beckham found that his students had good skills but few opportunities to develop them in real-world settings. So he created the New York City internship program. Despite initial struggles with transportation and housing, the interns got a world-class experience. Beckham lent $1,000 to one student who could not otherwise have afforded to go. No matter where Beckham went, innovations seemed to follow. He created the BYU Evening School (now Continuing Education) and the Travel Studies Department. He founded the Cougar Club and began Education Week. He organized the Young Ambassadors and recommended that Janie Thompson (BA ’43) be brought in to run the performing groups of the Student Program Bureau. One driver of Beckham’s success was his willingness learn from his failures. Once, when in charge of BYU’s admissions recruiting, he flew down to Los Angeles with BYU president Ernest L. Wilkinson (BA ’21) and other dignitaries for a big meeting with potential students. Despite his arrangements, not a single soul showed up. He did better follow-up from then on, and that embarrassing situation wasn’t repeated. And in just three years Beckham met Wilkinson’s goal of doubling BYU’s enrollment. Beckham’s service to the Church and community was no less profound. 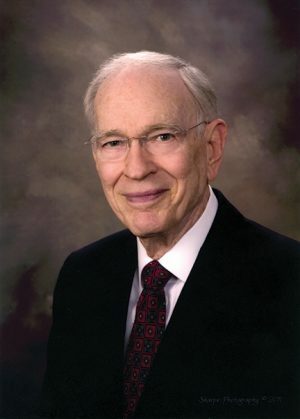 He served as a bishop in the first-ever BYU stake and later as a regional representative. He was on the board of directors for more than 20 businesses and charities, including the Red Cross and Boy Scouts. Beckham, legendary for his generosity, provided numerous scholarships to students and gifts to community residents in need. He was a loving husband and father of five, married first to Ida Lee and then to Janette Hales after Ida’s passing in 1994. Both women were equal partners to Beckham, and their input and involvement made Beckham’s achievements theirs as well. Though tireless in his efforts to build BYU, Beckham was not driven by ambition or power. He loved people and was a genuine friend. Part of his creed was to live each day as if it might be his last, and he managed to do that until his passing last October. He was inspired by BYU and its mission and lived a life that inspired others in turn. Ray Beckham is the last living bishop of the very first BYU wards and stakes, which were organized in the 1950s.